Corrie is a painter at heart and has called for painted backgrounds in this weeks Stampotique Designer's Challenge. I must confess, I began with a painted background but I could not help myself by keeping it in the background and collaging over it! I began by painting a piece of watercolor paper with two hues of green. I applied a white wash with watered down white acrylic brushed over the paint. I pulled scraps in the same color family along with book paper and washi tape. My stamped image "bird in a cage" is colored and machine stitched with gold thread. 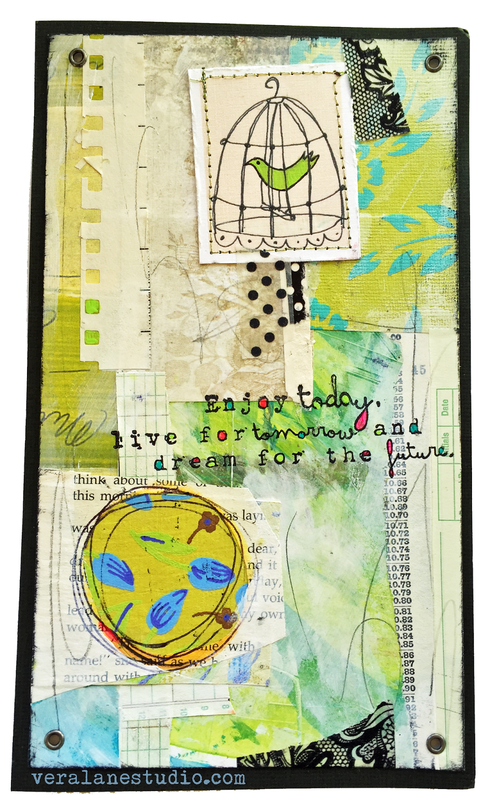 Maria Sabina Rits's "Enjoy today" quote is stamped over the painted collage with tuxedo black Momento. Posca paint pens are used to color open areas in the letters. The collage is attached to a piece of black cardstock with grommets. 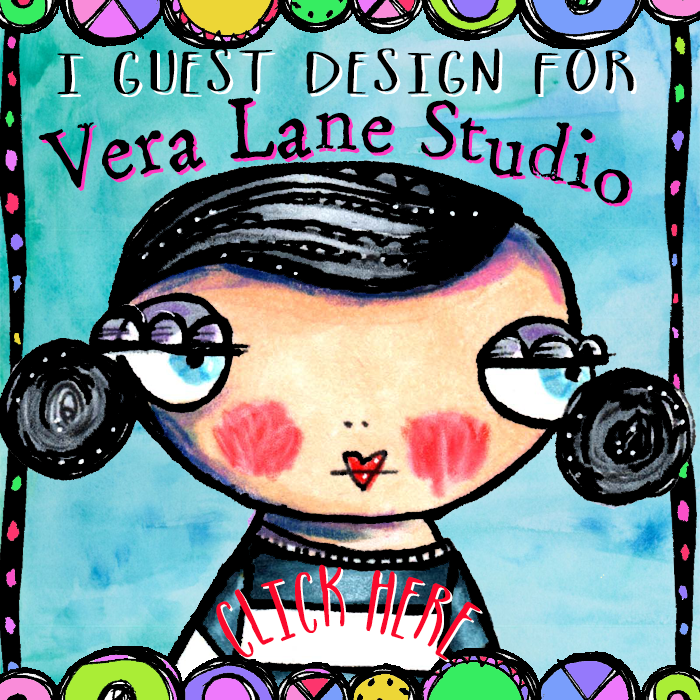 The Housewives of Vera Lane are whimsical and quirky to say the least. I thought they would make fantastic bookmarks. 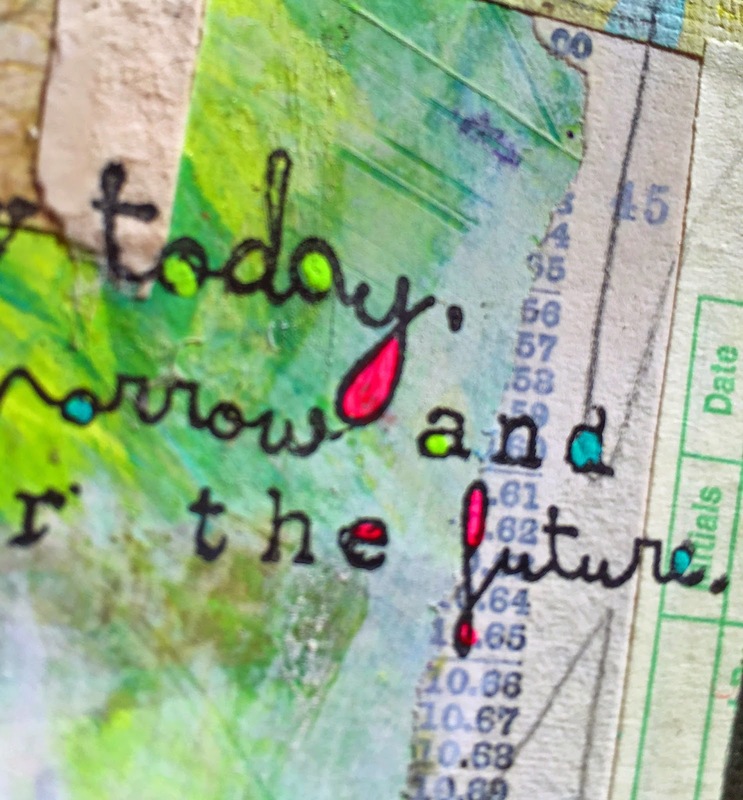 These mini collages are fast and satisfying to make, and a useful departure from ATCs. So make some with me! I arranged and printed the gals on white cardstock. They are colored with Copics , a couple are paper pieced. I applied old book pages and scrap paper to cardstock measured to 2.5 x 6 and 2.5 x 7 inches. After collaging my precut cardstock I used mono adhesive tape to attach the digi image in place. Paint pens, Pitt liners, and washi tape complete the tiny compositions. Cold laminate is applied to the front and back of the bookmark and trimmed. How fun to make a batch for your next book club! Tuck one or two in an envelope and mail to an avid book lover. Punch a hole in the top and use as a long hang tag. 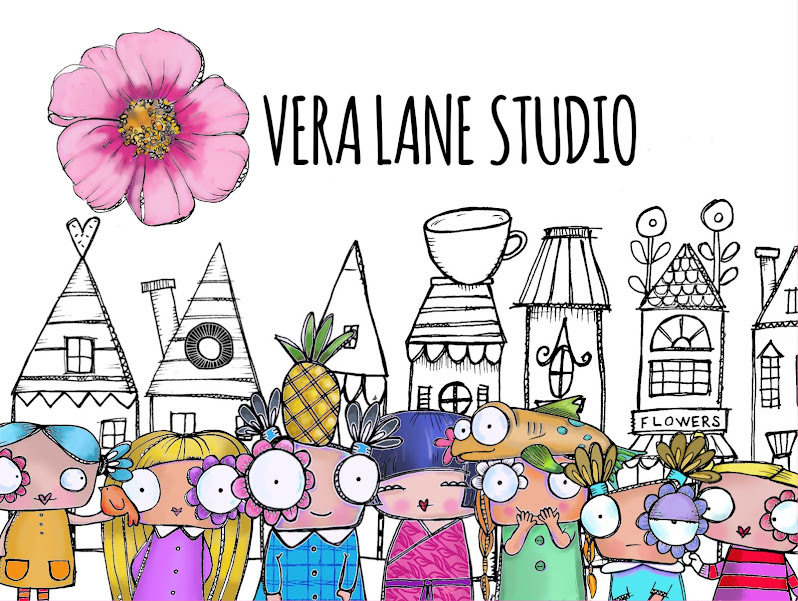 These four gals are available for instant download in my Etsy shop. I hope you enjoyed this quick craft fix. Happy New Year! 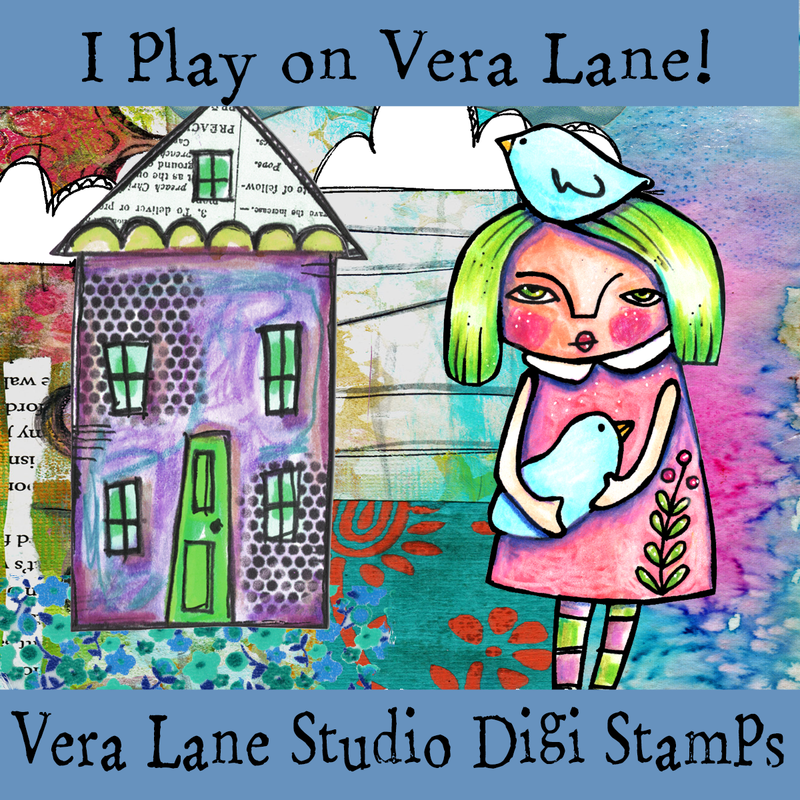 This is my first post for the Stampotique Designer's Challenge since consolidating our design blogs. Kaz has requested we cheer up January with a splash of color for SDC 178. 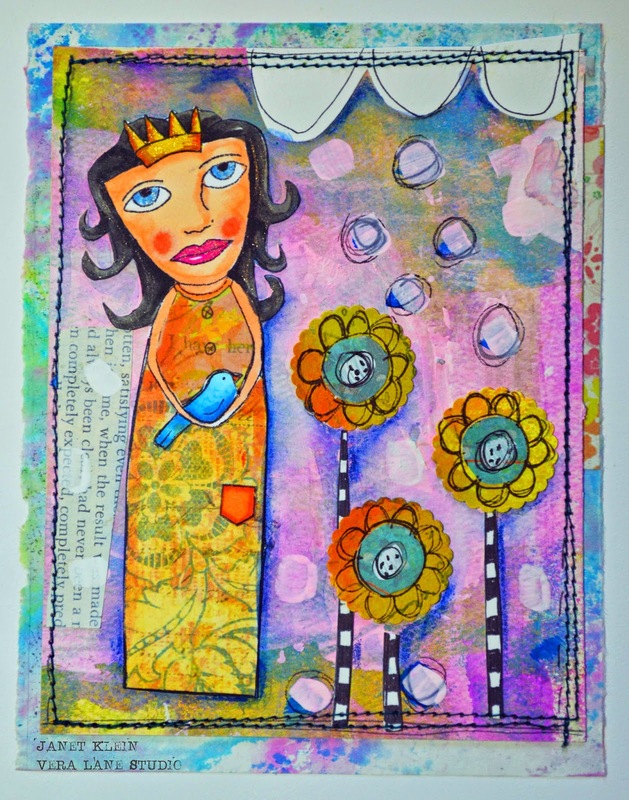 I am bringing my color splash with Roc Nicholas's lovely Bird Princess. My background began with pressing colored tissue on a watercolor surface with a damp sponge. I stamped Bird Princess on a piece of white card stock and again on pattern paper. She is colored with Peerless watercolors and a waterbrush. I love these watercolors and if you hacen't used them you will flip for them! The princess crown and lips are accented with a Stardust Gelli pen. I used and x-acto knife to cut away the bird, arms, and pocket from the pattern paper to allow me to paint the cardstock. I added hand drawn flowers and a snip of newspaper, and white scallop scrap for balance. I added additional watercolor to my background with white acrylic dotted with my finger tip. The scene pops with color by accenting the image edges with Prussian blue. The scene is stitched to another piece of tissue dyed paper. I love the openness of Roc's images for coloring and paper piecing. I hope this princess with sweet little bird has brightened your day. So get out your colors and join us in this color splash at the Stampotique Designer's Challenge. Best of all is a chance to win $30 of Stampotique Stamps. The Documented Life Project 2015 has rolled out with the first challenge of the year. "Be your own goal keeper" prompt brought me to my commitment to eat healthy and stay fit. As someone who fights two autoimmune diseases, keeping these goals is life changing. 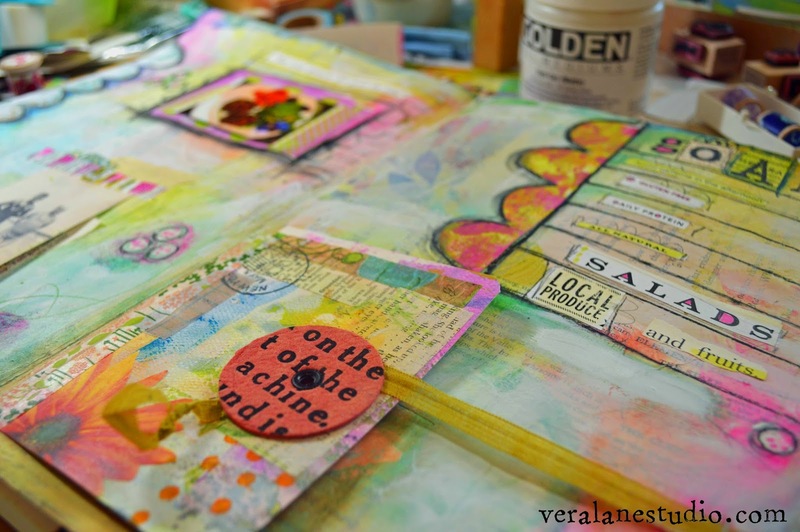 I began with the suggested book paper applied with Golden Soft Gel Medium. 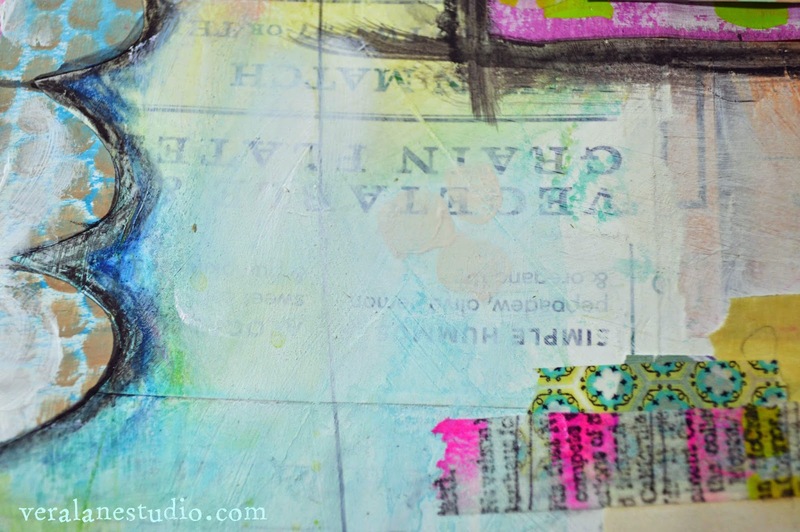 When that was dry I used Inktense blocks wiped with a baby wipe to blend and soften my greens and teals. Because of the color intensity I preferred using Faber-Castell Gelatos for my pink and oranges. I softened the colors with a white wash of acrylic paint. 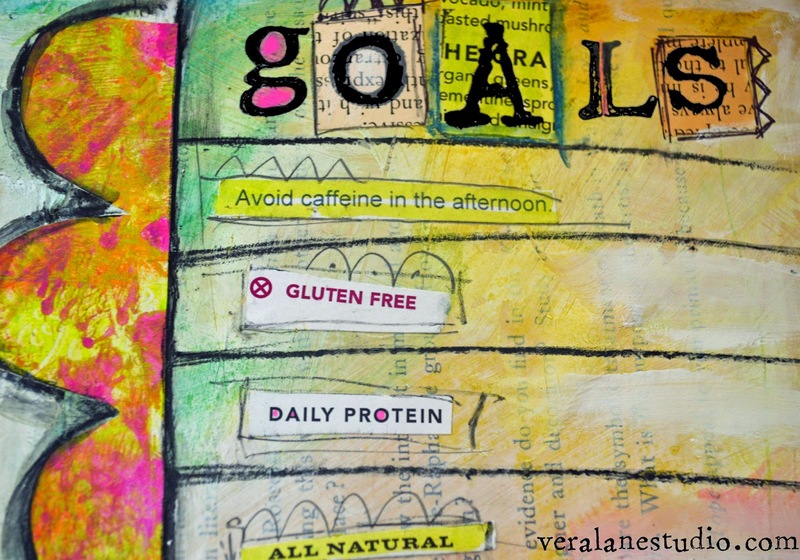 I listed my nutrition goals with scraps from menus and nutrition handouts. 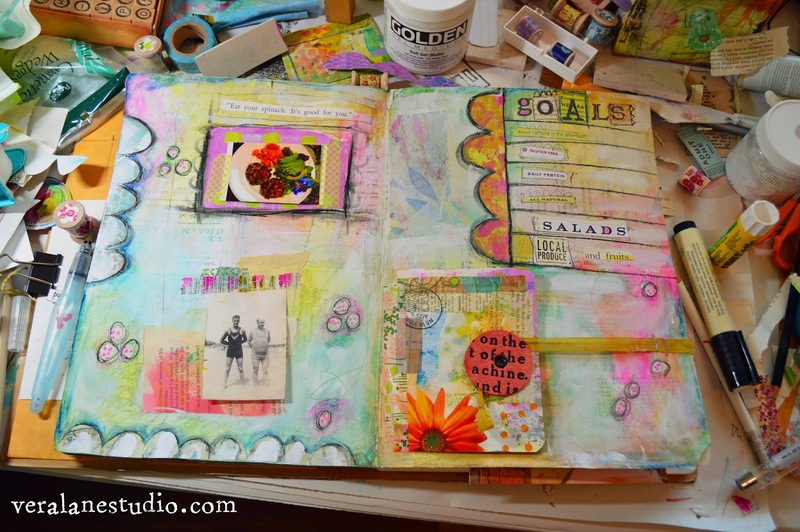 "Goals" was stamped with my Random Acts Alphabet stamp set by Stampotique. A Stabilo All 8046 black pencil was used for lines and random marks. Adding a bit of water from a waterbrush makes the black more intense. I collaged a small cover that is hinged with Washi tape and secured with a ribbon. This random photo of my fit grandfather with an unknown "less fit" person just seemed to make its way to my page. To preserve the original photo, this is a color copy. I took a picture of one of my favorite recipes and printed it with my pocket LG printer from my phone. It is mounted on painted paper with Washi tape. The scallop borders are cut from painted papers I had in my stash. Areas were toned down by randomly wiping gesso with my fingers. I had no idea where I was going with this and I tend to only see the areas I'm unhappy with. Another goal is to try and not be so critical and venture into each page as a learning opportunity.